Random Lake, WI -- According to the World Tourism Organization, international tourist arrivals surpassed the milestone one billion tourists globally for the first time in history in 2012. When multiplying that by the luggage each traveler carries and the valet services that support traveling, it becomes apparent that small but critically important components in the travel industry are luggage and valet tags. Badger Tag & Label Corporation is seeing a resurgence in requests for these tags and the complexity of features that make up each tag. Luggage tags are not those that an individual traveler places on his/her suitcase, rather they are commonly known as a bellmans tag, claim tag, front desk tag, or baggage claim tag. Used extensively by hotels, this type of tag may include room number, bag quantity, and agreement. A combination tag and label allows hotel staff to adhere a numbered label to each bag, further assuring each piece ends up in the proper room. Tour companies are also high volume users of luggage tags. Valet tags are used by hotels, restaurants, airports, athletic clubs, hospitals, casinos, and other facilities that offer valet parking service. Typically they are three- or four-part tags with the parts perforated between. The parts may consist of a windshield or dashboard section, stub that remains with the keys, and claim ticket. Information printed on the parts may include matching numbers, vehicle details, agreement, and vehicle diagram. “During our extensive company history, we have produced a diverse range of luggage and valet tags for many different customers. New customers can benefit from this expertise when they explain applications they have for their custom tags and labels. Typically we can provide samples of a format (including perforations, slits, patches, tag/label combos, etc.) to work from which makes the ordering process go smoothly,” says Rita Horstmeier, Sales/Marketing Manager at Badger. Tags can include a cotton or elastic string, or wire for attachment of the tag. Additionally a diecut circle with slit is another common means of attaching the tag. As with all tags that Badger Tag & Label produces, they can be printed on paper or synthetic stocks. Certain synthetic stocks are UV stabilized, withstand temperature extremes, waterproof, and puncture and tear resistant. Tags can be printed from one to six spot colors, or four-color process; and on just one or both sides. Small but critically important components in the international travel industry are luggage and valet tags. 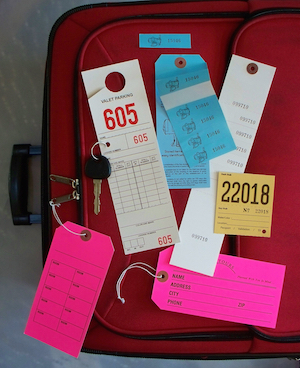 Luggage tags are commonly known as a bellmans tag, claim tag, front desk tag, or baggage claim tag. Used extensively by hotels and tour companies, this type of tag may include room number, bag quantity, and agreement. A combination tag and label allows hotel staff to adhere a numbered label to each bag, further assuring each piece ends up in the proper room. Valet tags are used by hotels, restaurants, airports, athletic clubs, hospitals, casinos, and other facilities that offer valet parking service. Typically they are three- or four-part tags with the parts perforated between. The parts may consist of a windshield or dashboard section, stub that remains with the keys, and claim ticket. Information printed on the parts may include matching numbers, vehicle details, agreement, and vehicle diagram. For more information, free samples, or to submit a project for a production estimate, call Badger Tag & Label at 1-800-331-4863, or e-mail: sales@badgertag.com.